In case you haven’t heard, we’re in a bit of an affordable housing crunch. Non-profit developers have been aware of this problem for some time. Approximately 8000 families applied for the 184 units of affordable housing that the East L.A. Community Corporation has built in Boyle Heights and East Los Angeles recently. 1500 families vied for a spot in the 60-unit residence on Whittier Bl. built by the Retirement Housing Foundation last March. And RHF was expecting as many as 2500 applications for the affordable, 78-unit senior residence set to open next door. More than 1000 families applied to live in a 90-unit residence in Macarthur Park built by McCormack Baron Salazar on land owned by Metro. And these figures likely don’t include the folks who are desperate for housing but do not earn the minimum amount required to qualify for consideration. But even as the need for affordable housing grows, the city’s ability to provide and maintain it has declined significantly. Since 2008, funding for the city’s Affordable Housing Trust Fund (AHTF) has dropped from $108 million to approximately $26 million. And, despite Mayor Eric Garcetti’s vocal support for affordable housing, no new funds were allocated to the AHTF in the last budget. While L.A. will likely receive some of the (anticipated) $130 million in funds set aside for affordable housing from the first year of cap-and-trade, the funds will first need to be divvied up among municipalities across the state. Which is why it was heartening to see the Metro Board move forward on its plans to set aside at least 35% of units built on Metro-owned land for affordable housing and to establish a fund to assist non-profit developers in building or preserving affordable housing on privately-owned land near transit. It’s not a panacea, as discussion of the 30-page staff report assessing the viability of the plan made clear. And there is much left to be done in the way of hammering out funding structures and sources for the loan fund or the criteria for discounts on Metro-owned land to entice developers to build affordable units. But it is a step in the right direction. 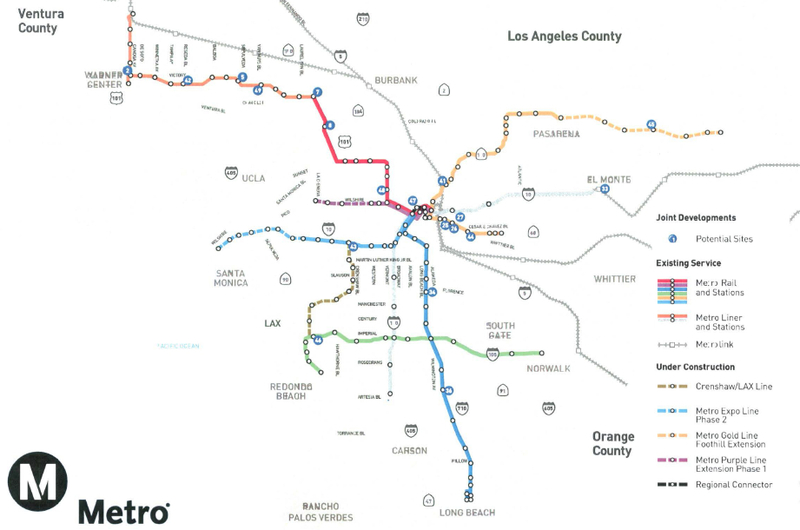 Metro’s inventory of current and potential joint development sites along Metro’s Gold, Expo, Crenshaw/LAX, Regional Connector, and Purple Lines. How Metro might partner with local municipalities to invest in transit corridor sites, potentially leveraging municipal housing funding. The viability of requiring 30%* of Metro’s jointly-developed housing to be affordable housing (to date, of the approximately 2,017 units built on 9 Metro-owned sites, 622, or 31%, are affordable units). *The number has since been amended up to 35%. Amending the existing Joint-Development policy to allow proportional discounts to the fair market value of MTA-owned property for the purpose of contributing towards the cost of affordable housing development. The creation of a Countywide Transit-Oriented Affordable Housing (TOAH) loan fund, potentially in collaboration with local Community Development Financing Institutions, that would facilitate the development, improvement, or preservation of affordable housing within a 1/2 mile of a rail or Rapid Bus stop. Establishing a TAP purchase program for residents of joint-development housing. The report came down in favor of the policy, citing studies showing that those of modest income living near transit are more likely to use it and do so with greater frequency than wealthier residents would. It also underscored the importance of such a policy by acknowledging that the rising costs of housing near transit and the reduction in federal and state funds available for affordable housing could both displace poorer transit-dependent residents and, in doing so, inadvertently make them more car-dependent. The study identified 19 potential Metro-owned sites for redevelopment, 10 of which it scored as viable for housing (listed below, and mapped out above). Those with low scores were seen as infeasible for housing due to size, location, or other constraints. The report also suggested that Metro pursue a portfolio-wide approach to affordable housing rather than a project-oriented one. Ensuring that the total number of units across projects met the 35% benchmark instead of trying to build affordable units at each site would likely be more cost-effective and ensure that Metro would see a stronger revenue stream from market-rate units at the costlier sites. The approach would also make it easier for communities in need to see higher percentages of units dedicated to affordable housing and for others who did not value affordability in new projects to limit the number of affordable units available. Among the boardmembers, the housing policy appeared to have a wide base of support. 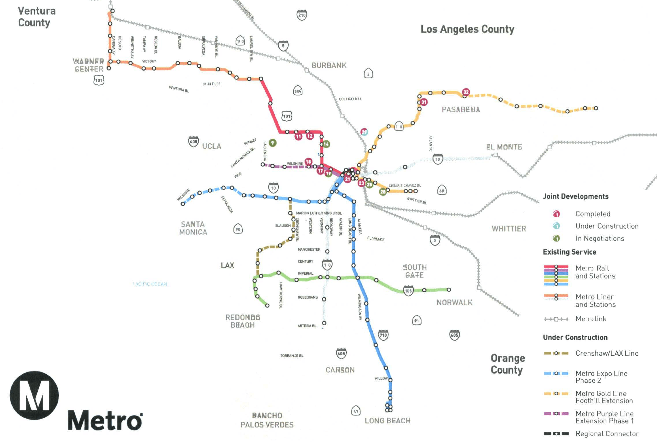 In his opening remarks on the agenda item last Thursday, Mayor Garcetti strongly endorsed the idea of Metro playing a greater role in preserving the affordability of transit-oriented communities. Underscoring the findings of the report, he said that, given that approximately 80% of Metro’s ridership hails from households earning less than $50,000 annually, it was important to ensure those residents’ continued access to transit by prioritizing affordability and the prevention of displacement around transit. A number of boardmembers also expressed their support for the policy. Hilda Solis only asked that community engagement be considered essential to the process of planning for the Metro-owned sites, citing its importance in understanding how gentrification and displacement can impact poorer communities. Unsurprisingly, some boardmembers got hung up on the question of how to create the Transit-Oriented Affordable Housing fund to support projects on non-Metro-owned property (details of how the fund might be set up begin on p. 25). The report suggested that, using funds sourced from the General Fund, a revolving $2 million TOAH fund (paid into for five years, up to $10 million total) could aid potential non-profit and community developers in acquiring the “long-term, patient, higher-risk, flexible capital” that local lenders do not have the capacity to supply. Such funds could be used to “jump start” development activity within a 1/2 mile of transit sites in some neighborhoods, purchase, preserve, or rehab (or just plain hang on to while other loans are secured) de facto affordable housing under pressure from rising property values, promote “early start” projects (projects in existing affordable project pipelines that could be launched with a low per-unit investment and paid back quickly), and support mixed-income and/or mixed-use projects that could provide some affordable housing without deep subsidies. Given the “looming operational deficit,” Boardmember Diane DuBois wanted to be reassured that the General Fund — the source of Metro’s operating budget — would not be harmed. Arguing it was important not to add to the strains on the system or dilute its ability to perform its core function of supplying transit, she asked that the CEO report back regarding the feasibility of establishing the TOAH fund using sources outside the General Fund and how such a fund might be distributed so as to ensure geographic equity. Boardmember Don Knabe concurred, citing his support for the housing policy, but encouraging Metro to protect the General Fund and to spread TOAH funds throughout the county. (DuBois’ motion was later amended to ensure that Metro studied the feasibility of drawing from both the General Fund and outside sources). Boardmember Jackie Dupont-Walker, on the other hand, seemed confident that not only could a TOAH be funded without unduly harming the General Fund, but it could and should be used for more than housing. For the community organizers from Union de Vecinos and Proyecto Pastoral that had attended the meeting to express concerns about the policy, a few questions remained unanswered. Their greatest concern was that the housing policy will struggle to aid the very folks that need it most. As discussed in-depth here, when federal funds are used to build local housing, the accompanying federal guidelines can unintentionally shut thousands of lower-income transit-dependent households out of the running for a spot in a new development. The guidelines calculate rents and maximum and minimum income requirements using the Area Median Income (AMI) of L.A. County — $81,500. By that scale, a family of two or more people would need to earn a minimum of $16,500, $22,020, or $27,510 (depending on the set-aside, below) to qualify for a unit. But in lower-income communities like Boyle Heights, where Metro has five affordable housing projects on the slate and the median income is only $33,325, thousands of needy families will both be unable to access the units and subjected to the very pressures of rising property values/rents that Metro cited as a major concern in its own report. Acknowledging the affordability of affordable housing was indeed a problem, Boardmember Mike Bonin asked outgoing Metro CEO Art Leahy if Metro would have the opportunity to structure the loan fund in such a way as to prioritize low- or very-low income housing. Knowing more about the habits of existing and potential residents could help in crafting more successful policy — particularly in determining which projects might be best served by a TOAH loan and the kind of TAP purchase program (proposed as part of the housing policy) might best serve residents in new projects. In the end, the Board concluded by receiving and filing the report and approving motion 51.1 (with the amendments by Boardmembers DuBois and Dupont-Walker noted above). Metro’s CEO will be reporting back during the fiscal year 2015-2016 budget discussion with recommendations on how to structure the loan fund, discounts for Metro-owned land, the TAP purchase program, and Memoranda of Understanding with local municipalities to facilitate the development of affordable housing on Metro-owned property. Given the uncertain timeline, that CEO may be Phil Washington, who will take up the reins at Metro in May. If so, we may have some interesting proposed solutions to look forward to. Washington oversaw similar policies aimed at carving out space for what he refers to as “Transit-Oriented Communities” in Denver and is said to have had a strong and personal commitment to ensuring the system is equitable. In the meanwhile, we’ll be exploring what this policy could mean for developers, communities, and transit-oriented development, including efforts to ensure equitable transit-oriented development along the Crenshaw Line. All of this won’t mean anything as long as NIMBYs get there way. The first thing they will scream about is traffic and how these Specific Plans are not in alignment with the General Plan. Then they will galvanize a grass roots organization, hire a slick anti-growth lawyer like Robert Silverstein, and make sure anything higher than seven-stories get squashed. The question is whether metro can do both- transit and housing. I have my doubts. Isn’t there an existing org that would be better at housing? 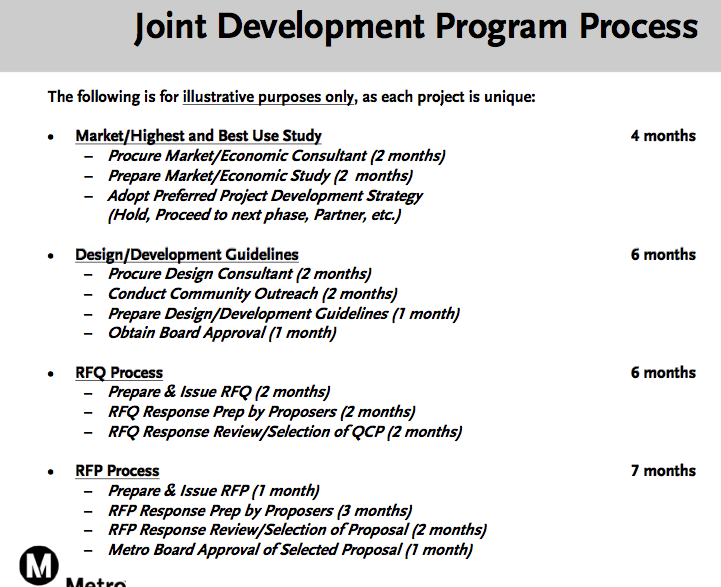 They’re likely to do “joint development” – Metro owns the land and puts certain conditions on it, then they invite the private sector (including non-profit developers) to develop sites. It doesn’t take tons of Metro resources – but they have to put some time and effort into making it work. And will they be forced to include costly underground parking spots for all of these “affordable units”? One step forward, two steps back if you ask me. They are looking at the kinds of incentives/discounts/etc. that could be offered to developers in order to entice them to build more affordable units. I am guessing parking requirements could fall into that mix, but it didn’t come up at the last board meeting. My guess is it will vary by site/neighborhood, and that probably is as it should be. In Boyle Heights, where people are more likely to be juggling a couple of jobs in different parts of town, working irregular hours, shuttling kids around, and more likely to use a combination of bus and car over rail, getting housing at a rail station doesn’t automatically solve those folks’ connectivity needs, unfortunately (Assuming Boyle Heights residents had access to those units, that is). But in another neighborhood, rail may serve them really well and make reducing parking spaces really easy. 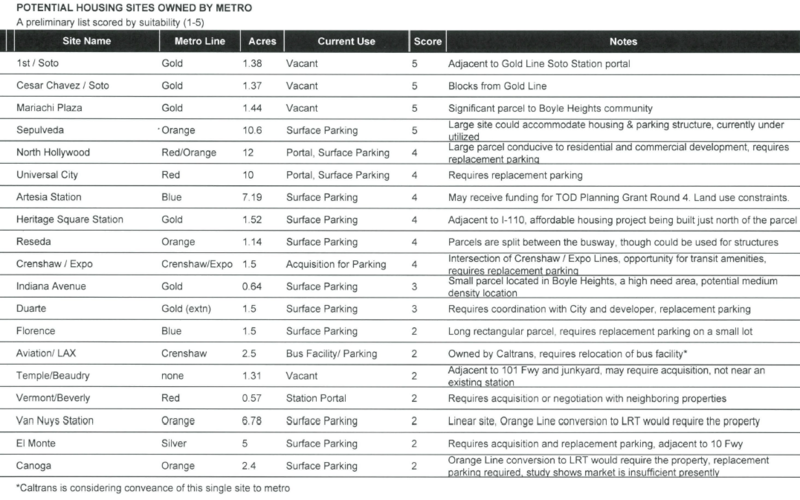 What it would mean for any Metro parking lots that were converted to housing, I have no idea… but you’re welcome to send your comments to the board or the CEO. The policy seems to be quite a ways off from being ready to go. In this case, I worry more that the city will do much to elevate this program and not do its due diligence in adding to the Affordable Housing Trust Fund so it can help shore up affordable housing along the corridors where Metro does not own land. I know it doesn’t help that federal and state funds for housing have dropped, but there is a genuine need here, and Metro cannot shoulder that burden itself. 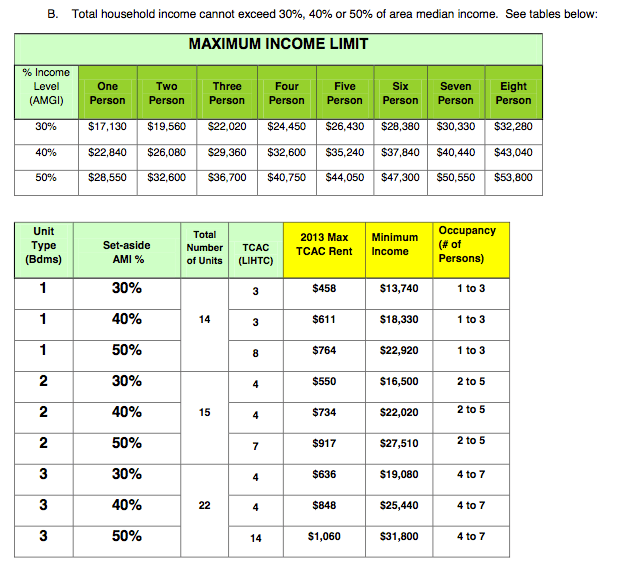 Thanks for including the income limit charts, they are very helpful. Area Median Income is a confusing but often quoted stat, but the article has the wrong area median income for LA County – its’ about $64,000/year for a family of four, not $81,500. It is often quoted, and I know I tracked it down somewhere before I first used it, but as i poke around more now, I’m seeing different numbers. ACS lists it as around $55,000 for the county while HUD puts it around 63,000, but notes it changes with the number of folks in a family. Do you have a link to your data source? It might be good for me to have a bunch of sources on file. Thanks! ELACC’s tables are calculated using that $81,500 figure for a family of four, as best I can tell, so now I’m a little more confused as to how different groups make these calculations. But many thanks for pointing it out! I used the State Housing & Community Development Department’s income limits for 2014: http://www.hcd.ca.gov/hpd/hrc/rep/state/incNote.html. As you can see from the page, there are different AMI’s for different programs. So even though it sounds like it is one number, half the people have higher incomes and half have lower, it’s really tweaked by different programs. I usually round the figures off and say about. I use family of three because that’s our average household size in the county, although most of the time people quote a family of four.